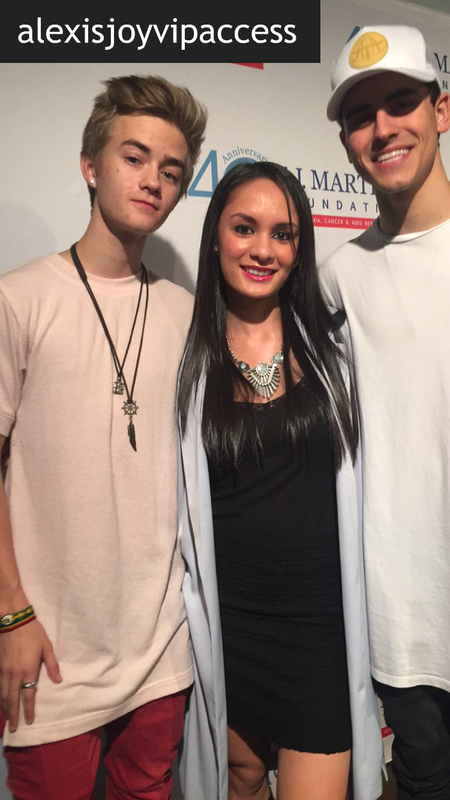 VIPAccessEXCLUSIVE: Jack And Jack Exclusive Interview With Alexisjoyvipaccess At The TJ Martell Foundation’s Family Day NY! From sharing a box of crayons while being best-friends in kindergarten to sharing the stage in front of thousands and thousands of fans screaming their names, stardom and success was destined for these two sensations: Jack Johnson and Jack Gilinsky! All it took was 6 seconds for every. single. person. to swoon over Jack Johnson and Jack Gilinsky as they first started off their incredible careers on the social media app, Vine. Before they knew it, their sensational Vines that went viral within milliseconds brought them to their awe-inspiring music career. Now, Jack Gilinsky and Jack Johnson are both literally taking the world by storm with their unmatched and massive success. Jack and Jack have been performing in basically every city and country you could name and just recently performed in Brazil, had a European tour and even performed at the renowned Wembley Arena. The remarkable Jack and Jack have over a whopping 1 million songs sold – talk about a jaw-dropping accomplishment, and their EP, Calibraska made it to #1 on the iTunes charts and #3 on Billboard’s Independent Album Chart. Both under the age of 21 and these two outstanding musicians have become household names! Saying that 2015 was an incredibly successful year for Jack and Jack is truly an understatement as one success continues to pour in after another. Jack and Jack were even nominated for “Web Star: Music” at the 2015 Teen Choice Awards and the 2015 Streamy’s “Entertainer of the Year” award. These two can cause a pandemonium just by clicking your “follow” button on Twitter, let alone when they step outside. So, next time you see a line wrapping around the block with thousands of fans cheering “Jack and Jack! Jack and Jack!” just know you’ve found yourself at a Jack and Jack concert! I, Alexisjoyvipaccess had the honor of covering the TJ Martell Foundation Family Day event in NY and had a fantastic time interviewing the extraordinary Jack and Jack at the event. Jack Johnson and Jack Gilinsky dished exclusively to Alexisjoyvipaccess all about what their favorite song is to perform in front of all of their fans and they even send out a super sweet message to all of YOU! Jack and Jack even took on a fun speed round where they spill on their fav emoji and their fav song at the moment – hear what Jack and Jack had to say in our VIPAccessEXCLUSIVE interview below. Thanks for the fun interview, Jack and Jack! Check out my VIPAccessEXCLUSIVE interview with the phenomenal Jack and Jack at the TJ Martell Foundation Family Day NY below! The outstanding TJ Martell Foundation was back with its inspiring Family Day event in NY bringing together some of your favorite musicians all for a great cause. From excellent performances, to bowling with your favorite celebrities and other awesome, charitable events – the TJ Martell Foundation Family Day NY event was one unforgettable day for everyone and the best part of it all – all the proceeds help fund cancer and AIDs research. What an extraordinary event! Previous VIPAccessEXCLUSIVE: Joe Jonas And DNCE Interview With Alexisjoyvipaccess At The TJ Martell Foundation Family Day NY! Next Article: How Did The “Talia In The Kitchen” Cast Celebrate Christmas? Find Out Here!